From 1 April 2018, the UK is putting in place a type of sugary drinks tax – actually a “soft drinks industry levy”. This blog reviews how they are doing it, early signs of its success, and ponders its relevance for NZ. We also take this opportunity to point out some problems with a recent NZIER Report on sugary drink taxes. This is not an April fool’s joke. On 1 April, the British put in place a sugary drinks tax – actually, a tiered soft drinks industry levy. The UK is joining many other countries and numerous jurisdictions that now have some variety of a sugary drinks tax,1 a public health measure that is rapidly gaining traction amongst countries concerned about their growing rates of obesity and diabetes. 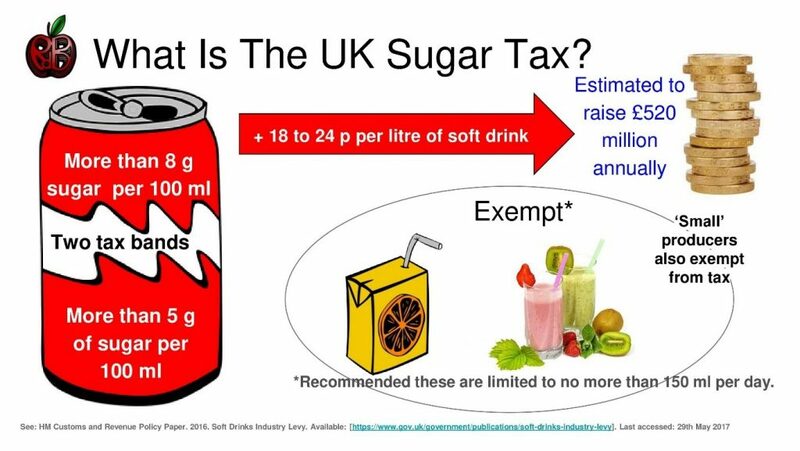 In this blog we explain how the UK levy works (it is clever), what health impacts this levy might have (it is much more than via the direct price signal to the consumer), and critique a recent NZIER report on sugary drinks taxes. How does the UK soft drinks industry levy work? Not all sugar taxes are the same – far from it. First, we are talking about sugary drinks tax; the evidence on the negative health impacts of sugary drinks is much stronger than it is for any food. 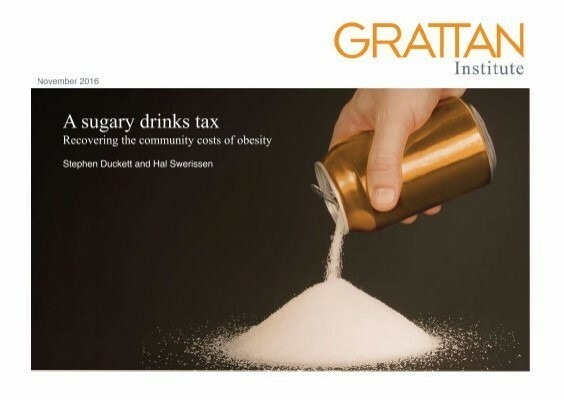 Second, sugary drink taxes can be configured in many ways – let’s jump across the ditch and use an excellent report from the Australian Grattan Institute on possible configurations.2 Below is a summarized version of one of their tables. 4. Ad valorem excise tax 20 per cent tax on the retail value of SSBs. Keeps pace with inflation. * Our extra note: this issue of “eroded by inflation” could be addressed with annual inflation adjustments (as is used for tobacco and alcohol excise taxes in NZ). The ‘best’ tax from a theoretical perspective is probably option 1 – a tax exactly on the key harmful ingredient: amount of sugar. (For simplicity we are ignoring here other potentially harmful aspects such as the acidity of SSBs and the phosphate levels). But this type of tax might be administratively difficult. The second option, the tiered levy on the soft drinks industry, is what is happening this month in the UK. The industry is levied proportional to the amount of drinks they sell in each bracket of sugar level – we quantify its potential health impact below. We suspect that this should be the best option for NZ. The last option 4 is the one most people think of – a percentage tax at the point of sale, much like GST. This has limitations. John Gibson, an economist from Waikato University, has argued that this tax could just see some people shift consumption to cheaper ‘just as sugary’ drinks. We agree that this is likely to happen to some extent with option 4 type taxes (indeed we see this with some shifting to budget brands after tobacco tax increases, even though overall tobacco consumption per capita keeps dropping each year in NZ). What impact might a UK soft drinks industry levy have? The incentives to change marketing to less sugary drinks. Moreover, we have seen in the last two months that supermarkets in the UK are now – of their own accord – banning sales of caffeinated energy drinks to children less than 16 years old. We cannot prove it, but it seems plausible that the new soft drink industry levy has helped tip British societal thinking. That is, as well as top-down change (the levy) there may be important bottom-up action whereby supermarkets realize they will have societal (=consumer) support for taking action. The literature reviewed by NZIER also seems rather incomplete. Eg, for the 9 studies that we are aware of which have examined the impact of real world sugary drink taxes on health – the NZIER Report refers to just one of them.6 The missed ones include studies suggesting health favouring associations for BMI/obesity78910 and for reduced cardiovascular disease11; along with studies showing no benefit for health.121314 Yet even for two of the latter studies finding no association – the authors suggest the null finding is probably because of very low tax rates in the studied settings and they recommend higher tax rates.1214 We are also surprised as to why the well-publicised report from the Australian Grattan Institute on sugary drink taxes published in 2016,2 was also missed by NZIER. Perhaps as a consequence of a suboptimal literature search strategy, NZIER have missed some key information and this may have limited the value of their conclusions. Finally, why were no declarations of interest made by NZIER – has it ever received funding from the food and drinks industry? Potential conflicts of interest may bias results. For example, there is strong evidence that SSB experimental research funded by or associated with the beverage industry reports biased results that favours these funders’ interests.15 Good quality reporting to a government agency (the Ministry of Health) should require full declarations of interest. Others have also critiqued the NZIER Report, eg Professor Swinburn of the University of Auckland in this op-ed. We hope that NZIER now gives some explanation of these issues so that the discussions around sugary drinks taxes is more thoughtful. The NZ Government would be strongly supported by the scientific evidence if it did opt for an SSB tax. There are now several real world health studies – but there is also a wealth of literature on how other excise taxes on tobacco and alcohol are effective in general. Nevertheless, we favour consideration of the UK soft drinks industry levy option (on theoretical grounds and given evidence it is already working4). We also like the UK approach to using the revenue raised to fund child obesity and diabetes prevention (in the UK it will be used to bolster school sports facilities). Furthermore, we note that the World Health Organization recommends taxing sugary drinks. And here in NZ, the NZ Medical Association and the Heart Foundation recommend taxing sugary drinks. Yes, there is a Cullen-led Tax Review underway now. But a UK style soft drinks industry levy is something that could be got on with now, and will not tip the apple cart in light of macro-level rebalancing of our total tax system. If the Government insists on no new taxes until after this review, then the case for SSB taxes makes a compelling case example to consider within a total tax system. Pak T-Y. The Unequal Distribution Of Body Mass Index: Examining The Effect Of State-Level Soft Drink Taxes On Obesity Inequality. University of Georgia, USA. Masters of Science Thesis, 2013. https://getd.libs.uga.edu/pdfs/pak_tae-young_201305_ms.pdf. Fletcher J, Frisvold D, Tefft N. The effects of soft drink taxes on child and adolescent consumption and weight outcomes. Journal of Public Economics 2010;94:967-74. Schillinger D, Tran J, Mangurian C, et al. Do Sugar-Sweetened Beverages Cause Obesity and Diabetes? Industry and the Manufacture of Scientific Controversy. . Ann Intern Med 2016;165(12):895–7. You allege that NZIER excluded studies because they’re beholden to industry interests. All but one of the studies you point to are outside of their inclusion window. They very explicitly state that they only include peer-reviewed journal articles published within the last 5 years. That means a 2012-2017 window. The simplest explanation for why they didn’t include those studies isn’t your defamatory insinuation that their interests in other consulting areas affected this MoH-funded work, it’s that those studies did not meet the inclusion criteria. Your failure to mention the inclusion criteria very clearly laid out in NZIER’s report while insinuating more nefarious motives is interesting.